1. Clathrocorys giltschii Haeckel, PB: 2869, LM, x 210. 2. Clathrocorys giltschii Haeckel, PB: 1268, SEM, x 165. 3. Clathrocorys giltschii Haeckel, Same specimen; detail of the cephalis and cephalic tubule, PB: 1268, SEM, x 390. 4. Clathrocorys murrayi Haeckel, PB: 2869, LM, x 210. 5. Clathrocorys murrayi Haeckel, PB: 3791, LM, x 210. 6. Clathrocorys murrayi Haeckel, PB: 2869, LM, x 210. 7. Clathrocorys murrayi Haeckel, P1: 4280, SEM, x 250. 8. Clathrocorys murrayi Haeckel, P1: 2778, SEM, x 260. 9. Clathrocorys giltschii Haeckel, PB: 3791, LM, x 210. 10. Callimitra solocicribrata Takahashi, n. sp. Paratype, PB: 3791, LM, x 210. 11. Callimitra solocicribrata Takahashi, n. sp. Holotype, PB: 3791, LM, x 210. 12. Neosemantis distephanus Popofsky, P1: 4280, SEM, x 520. 13. Zygocircus productus (Hertwig) group, P1: 978, SEM, x 440. 14. Zygocircus productus (Hertwig) group, PB: 2869, LM, x 210. 15. Tholospyris sp. group, PB: 2869, LM, x 210. 16. Tholospyris sp. group, PB: 2869, LM, x 210. 17. Tholospyris sp. group, P1: 978, SEM, x 440. 18. Zygocircus sp. 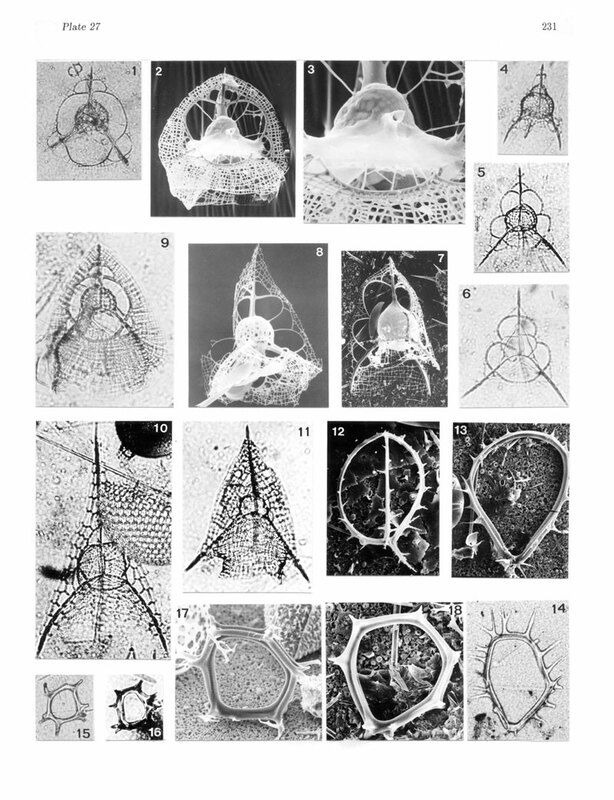 piscicaudatus Popofsky, P1: 4280, SEM, x 560.